Window Dressing # 8 – Flowers that bloom in the Spring tra la……………. 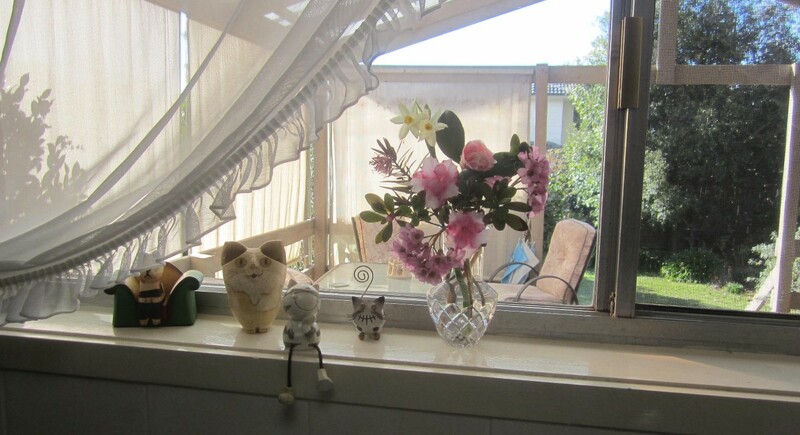 I don’t often show the right hand side of the kitchen windowsill – it has a fly screen on the window and the view can be a hazy. But would you look at that – dishes on the draining board means Catherine has actually stood there long enough to do some housework!! Of course I don’t mind too much when it’s a lovely sunny day like Sunday was – and after this brief interlude in domesticity I was out the door and like a shot. The previous post tells you what I did and saw but when I told you I’d picked the first Spring Bulb I didn’t mention there were a few others bits flowering as well. Not enough for a flower basket (well I haven’t actually got one but it did paint a pretty picture didn’t it lol) but they did have to be carried indoors very carefully for the Kitchen Window Sill. 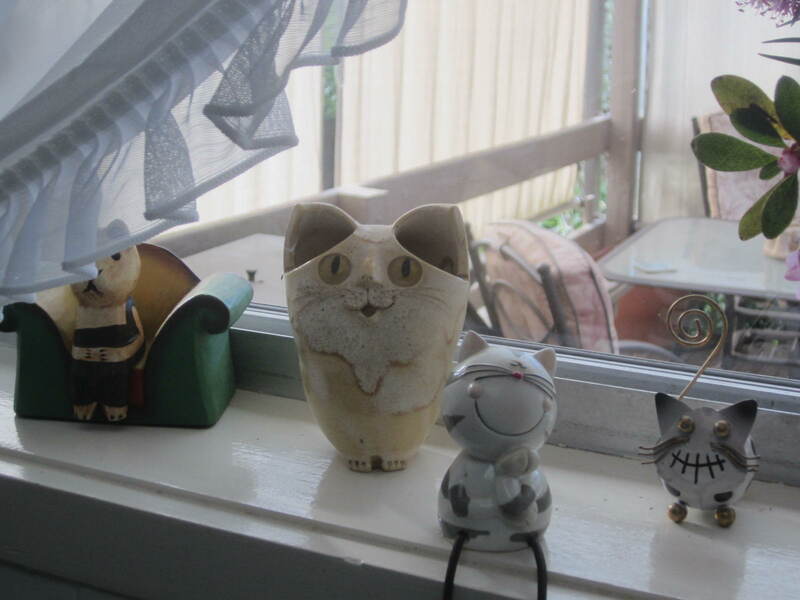 And of course there are the resident felines to consider – curly and his friends had been admiring the view since the beginning of last month so I gave Big Ears a treat and put him on there to keep them company. 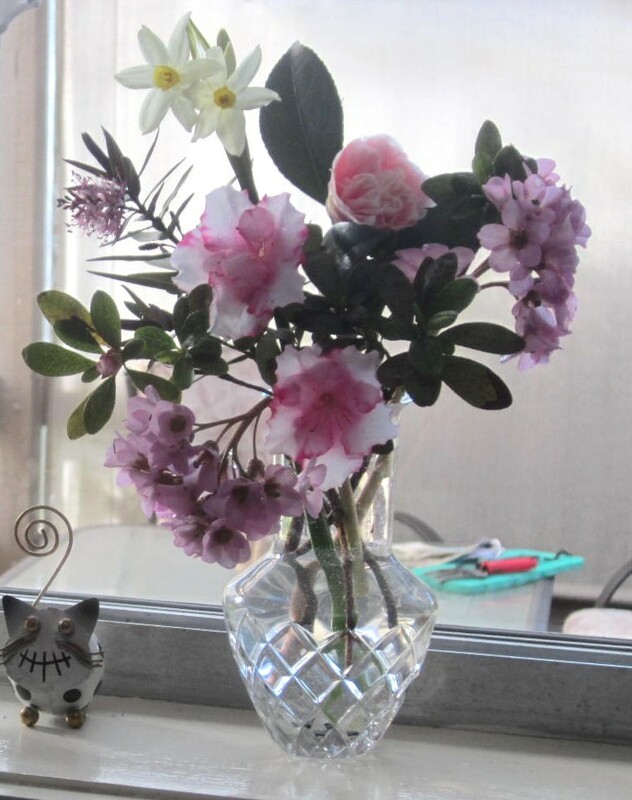 How’s your window looking these days – are there enough flowers to make you smile at the kitchen sink? 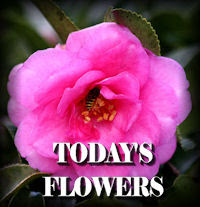 This entry was posted in Daily Life, Todays Flowers, Window Dressing and tagged cats, collections, kitchen window, Today's Flowers by Cathy. Bookmark the permalink. 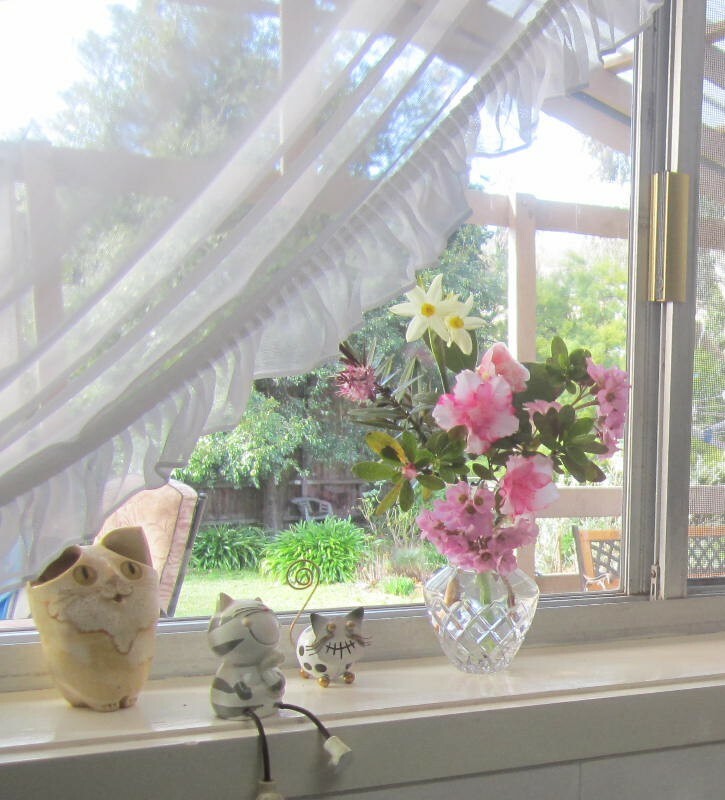 I need to pick some more flowers for my window sill. Your floral display looks lovely. 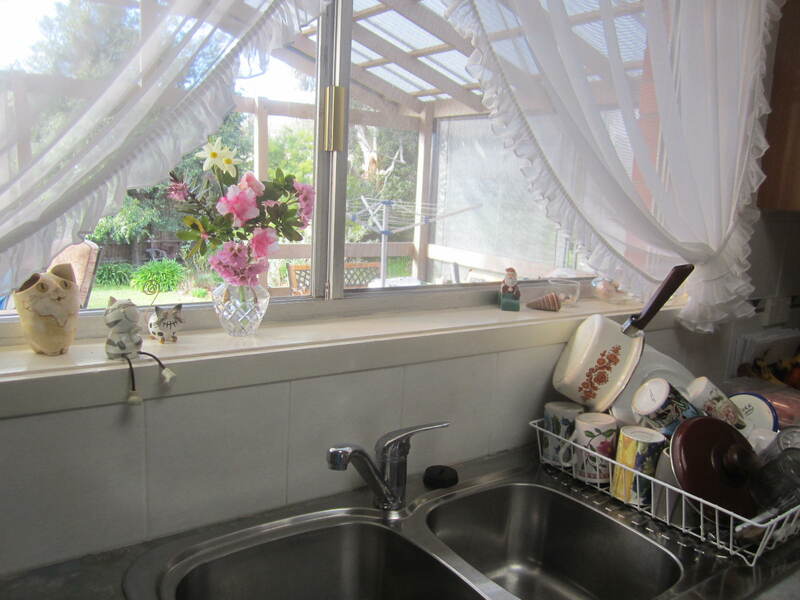 I dare not show anyone my sink….it has husband’s pineapple heads drying out on one side, assorted misery on the other….and it doesn’t have a window…just those pierced concrete blocks which give me mini views of the bougainevillea beyond. My bergenia in France used only to bloom when good weather was ahead..so for me that meant spring. Lovely flowers, Cathy! I like your white curtains, too. For us, it is summer with temperatures in the mid to high 80s F.
The colours of your pretty bouquet definitely say “spring.” I’d much rather be outside in the garden than indoors doing household chores too! Wonderful spot. Your kitchen looks lovely! I love a vase of blooms on a windowsill. They are very pretty! Wonderful pics! Hope you’d find time to visit Layered. this is a lovely window dressing…love the colors. and your cat collection is cute!